After a good weekend, Normal and hyper space are working as I expect they should. I can navigate in and out of the systems without any issues and I am pleased with the speed of the game. I am very happy with performance over what we had with Silverlight. I had some extremely annoying flashing when a ship entered or exited a system but those issues have been fixed. 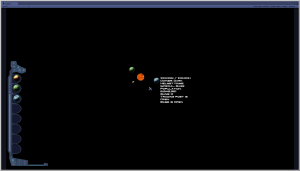 As you can see in this screen shot I need to rotate the planets to face the sun but it looks very similar to what we had in Silverlight and MWiV. I have come across a special effects package that I will purchase this week. It will add what we always saw in our minds eye in the original game. The package will create a fluid background with a star field and nebulae, weapons fire and an awesome planet management and attack screens. Soon I will have to create videos to show the progress. This screen shot the background is a plain black, this will change soon. The helm and radial menus are fully activated and a tool tips are active for most of the controls. Hovering over a planet gives the survey information about the colony. Items to do: Target selector/Torpedo ring, current target control, player ship indicators (shields/hull), radar menu needs detail work – its fully functional now, tactical menu, chat menu and command entry box. Note: I am still playing with the sizes of the planets and stars.